Bitdefender, world’s one of the most popular Antivirus company recently launched a new antivirus named Trafficlight.BitDefender TrafficLight is specifically designed to protect users while surfing net.It detects and blocks all web threats and malicious contents before reaching your browser. The coolest thing is that TrafficLight also taps BitDefender’s cloud network to check if accessed URLs are associated with phishing or black hat SEO attacks. Ad Filter – Blocks those annoying pop-up ads. 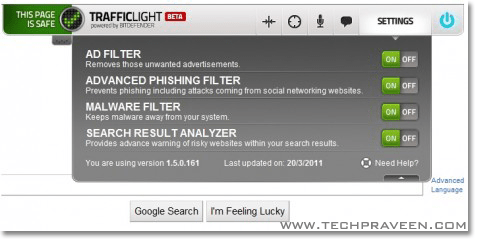 Advanced Phishing Filter – Prevents you from accessing websites used for phishing attacks. Link Filter – scans links from social networking sites such as Facebook or Twitter. Stealth Mode – It does not add a toolbar to your already-cluttered browser interface. Its interface remains invisible until your input is needed or it’s called up with a simple mouse gesture. Malware Filter – blocks any malware you come in contact with while browsing the Internet. Search Results Analyzer – Provides advance warning of risky websites within your search results. URL Shortening – Shrink and check links for viruses and spyware using saf.li. Compatible with all browsers – It works and integrates with all major web browsers like Internet Explorer, Mozilla Firefox, Google Chrome, Opera, Safari. It’s really a great service, free totally. Bitdefender is one of best security solution for home PC! You know I trust Kaspersky as well, but i am ready to use some new antivirus programs. Who knows – may be they will turn out to be the best one!